Buick's Insignia for America and China | What Car? There won't be many British car buyers familiar with the Buick LaCrosse, but the chances are that the car it's based on will become a best-seller over here. That's because the updated executive saloon is based on the new Vauxhall Insignia. However, it has received a substantial reworking, not least because it is seen as a Lexus rival by its makers. That means reworking the ride to be super-smooth, and ensuring the cabin is both refined and ultra-quiet. There are two engine options: a 256bhp 3.0-litre V6 with 214lb ft of pulling power, and a 276bhp 3.6-litre V6 with 261lb ft of pulling power. 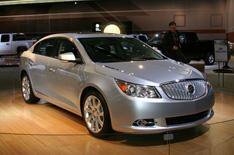 It will go on sale in autumn 2009, both in the US and China, where Buick is a major brand.